“THE UGLY AMERICAN” RESURFACES IN BEIJING – TRUTH IN MEDIA: TRUTH TRUMPS POWER EVERY TIME! 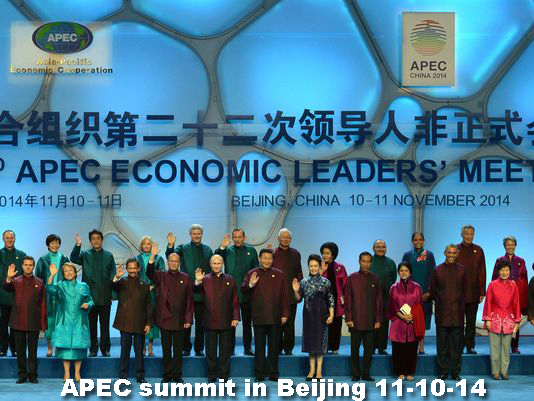 The Asia-Pacific (APEC) meeting in Beijing has been a grand and glitzy affair so far. 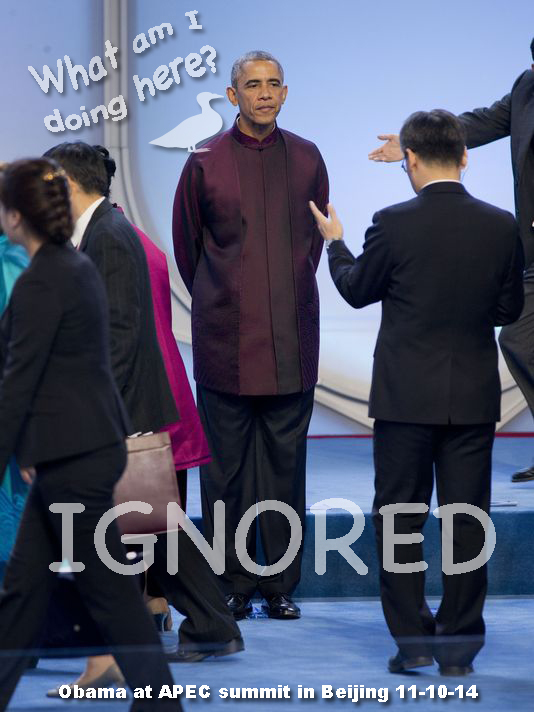 The Chinese hosts did not spare any expense in using the opportunity to shine as hosts of this year’s summit. Not since the 2008 Olympics, has the world had a chance to see such a display of beauty and grace in the Chinese capital. Well, and then enters “The Ugly American.” Like the character from a 1958 political novel by Eugene Burdick and William Lederer upon which a 1963 movie starring Marlon Brando was based, Obama spurned his hosts’ limo ride, and then added insult to injury by chewing gum as he arrived at the gala event. The Chinese were not pleased. They took it as an insult. “We made this meeting so luxurious, with singing and dancing, but see Obama, stepping out of his car chewing gum like an idler (bum),” wrote Yin Hong, a professor of journalism at Beijing’s Tsinghua University, in a tweeted message. (Also see the USA TODAY, FOX News articles, as well as the Wall Street Journal’s “Obama Chews Gum, Chinese Internet Goes Ballistic,” San Francisco Examiner “Gum-smacking Obama manages to insult Chinese” and Washington Times “Obama chews gum during APEC summit, irks Chinese” stories about this incident). Nor was this the first time this American president behaved like someone who has no manners. He was also caught by French TV cameras as chewing gum during the commemoration ceremonies last June in Normandy honoring the 70th anniverary of the allied landing. Like the Chinese today, the French viewers were similarly outraged. Yet the US media made a scant mention of that incident. As the Pentagon website points out, Normandy is a hallowed ground where more than 9,000 American and other allied soldiers were killed. So that 100,000 could advance and liberate Europe. And an American president paid his respects for their supreme sacrifice by casually chewing a gum. It seems unlikely, but it would really be a wonderful if at least abroad Obama would behave in a way that does not embarrass the rest of us Americans and makes the world hate us. Because we don’t have a private jumbo jet and the Secret Service to protect us when we travel overseas. Oh yes, Obama did meet one-on-one with the Chinese president on the sidelines of the APEC summit, and also exchanged a few words with Russia’s Vladimir Putin. But at the gala event, Putin was entertained mostly by the Chinese president’s wife, while Xi Jinping buttonholed Obama on the other side. 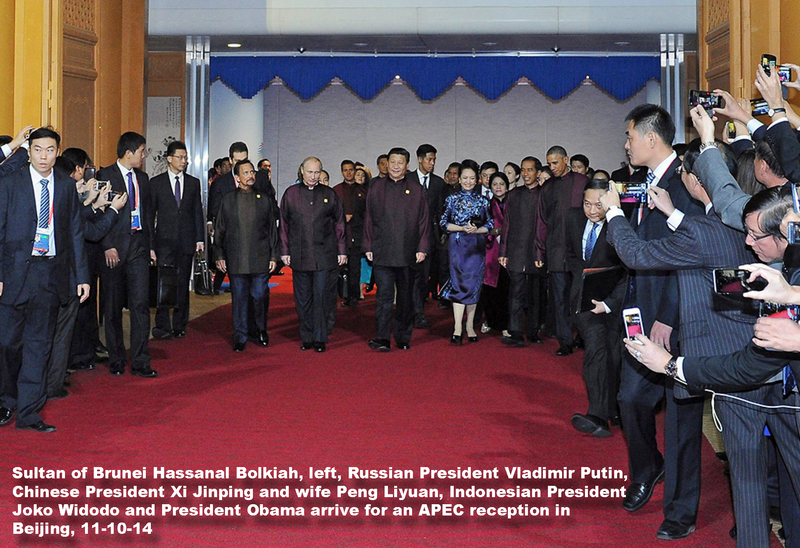 “It was a warm gesture on a chilly night when Vladimir Putin wrapped a shawl around the wife of Xi Jinping while the Chinese president chatted with Barack Obama,” the London Guardian said in its lead story today about the APEC summit in Beijing (see “Vladimir Putin’s shawl gesture to leader’s wife covered up by Chinese”). 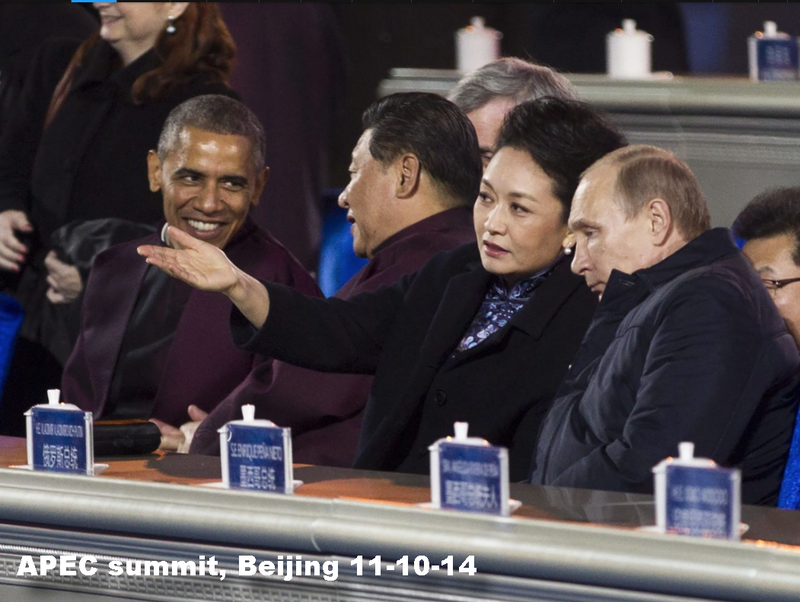 The only problem: Putin came off looking gallant and gentlemanly, the Chinese summit host gauche and cavalier. Making things worse for the Beijing authorities, the Russian president is a heart-throb among many Chinese women for his macho, man-of-action image. 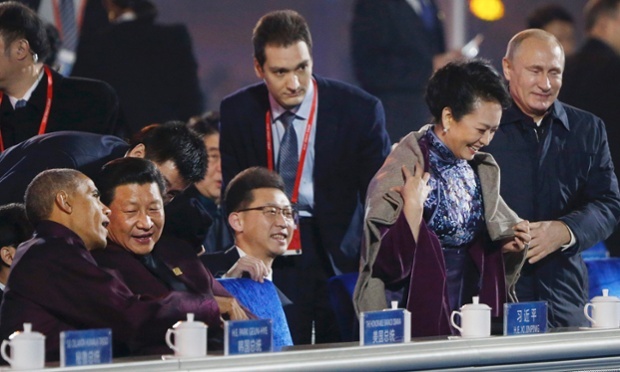 But being more attentive to the Chinese President’s wife in public than her husband was too much for them. So the censors scrubbed the video from the Chinese internet showing Putin’s shawl gesture. Just like that. Snipped and erased. Freedom of speech in China. And just think, that’s a country into which the US and other multinationals have poured over $1.5 TRILLION (!) in the last quarter century since the Tiananmen Square massacre. 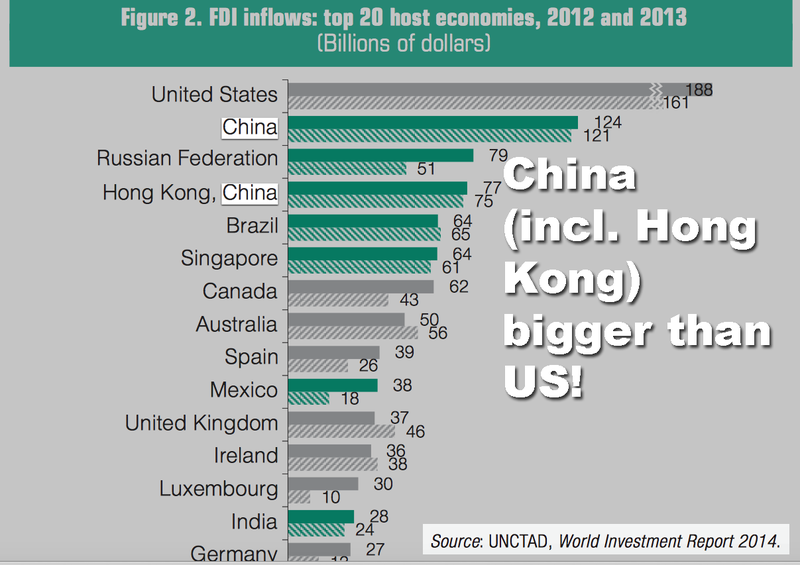 And the global investments into China and Hong Kong now EXCEED those in the US. Of course, things are not that much better in this country. 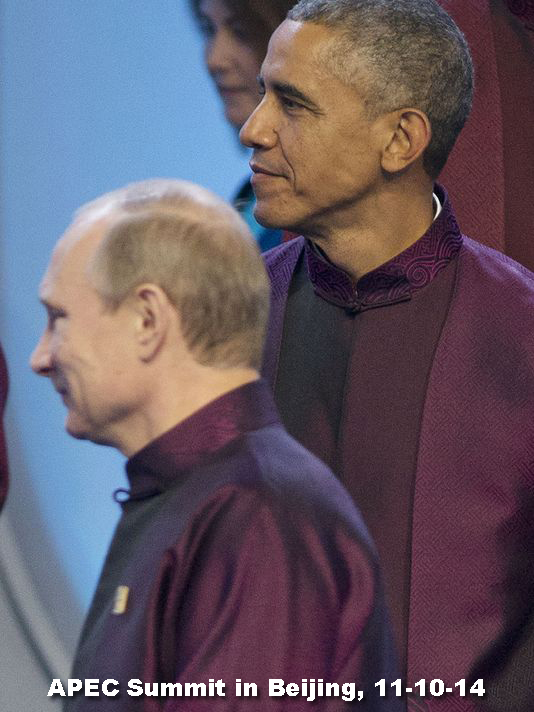 The Putin shawl incident got a much wider play in the American media than did Obama’s gum chewing fiasco. When all anyone can come up with regarding the activities dealing with an APEC Summit is to list out who is chewing gum and who is not, then that’s not “Truth in Media” any longer, that’s “Fox News in Media” 😉 P.S. When “Fox News” becomes a major influence and source of what we see here from the Truth in Media website, it sort of invalidates its namesake, don’t you agree? Guess this story must have touched the nerve, Don? If you are really interested in the whole truth, why did your forget to credit USA TODAY as another source? The Truth in Media did. And thanks to your satire, I have now done a little more research. Here are also some other stories in the national media about the gum chewing incident – Examiner, Wall Street Journal… are they also “invalidated” as reporters of truth?